By analyzing the light of hundreds of thousands of celestial objects, Johns Hopkins astronomers from the Sloan Digital Sky Survey have created a unique map of enigmatic molecules in our galaxy that are responsible for puzzling features in the light from stars. The map, which can be viewed online, was unveiled today at the 225th meeting of the American Astronomical Society in Seattle. "Seeing where these mysterious molecules are located is fascinating," said Brice Ménard, a professor in the Department of Physics & Astronomy at Johns Hopkins University. Added Gail Zasowski, another Johns Hopkins astronomer who played a key role in the project: "This new map required analyzing huge amounts of data and using the power of statistical analyses." These puzzling features in the light from stars, which astronomers call diffuse interstellar bands, or DIBs, have been a mystery ever since they were discovered by astronomer Mary Lea Heger of Lick Observatory in 1922. While analyzing the light from stars, she found unexpected lines that were created by something existing in the interstellar space between the stars and the Earth. Further research showed that these mysterious lines were caused by a variety of molecules. But exactly which of the many thousands of possible molecules are responsible for these features has remained a mystery for almost a century. This new map, based on Sloan Digital Sky Survey data that reveals the location of these enigmatic molecules, was compiled from two parallel studies. Zasowski, a postdoctoral fellow, led one team that focused on the densest parts of our galaxy. They used infrared observations that can cut through the dust clouds and reach previously obscured stars. 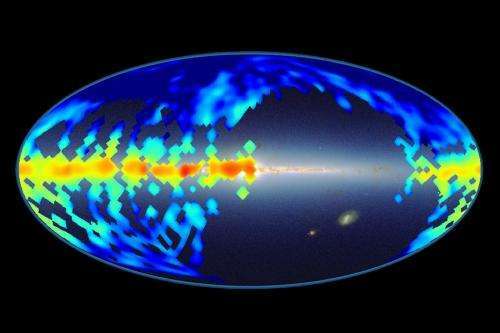 Johns Hopkins graduate student Ting-Wen Lan led the other study, which used visible light to detect the mysterious molecules located above the plane of the galaxy, where their signatures are very weak and harder to measure. "We do not have a full map yet, but we can already see a lot of interesting patterns," said Ménard, who worked on both teams. Lan's team analyzed the light from more than half a million stars, galaxies, and quasars to detect the molecules' features in the regions well above and beyond the Milky Way's disk. In addition, the team was able to see the types of environments in which these molecules are more likely to be found. Some molecules like dense regions of gas and dust, while others prefer the lonelier spots far away from stars. "These results will guide researchers toward the best observations and laboratory experiments to pin down the properties and nature of these enigmatic molecules," Lan said. To look toward the galactic plane, hidden behind thick clouds of cosmic dust, Zasowski's team used data from the Sloan Digital Sky Survey's APOGEE survey. APOGEE observations, which make use of infrared light, can easily see through interstellar dust and measure the properties of stars all over the galaxy. The team members detected some of the mysterious features in front of about 60,000 stars in a wide range of environments and were even able to measure the motion of these molecules. "For the first time, we can see how these mysterious molecules are moving around the galaxy," Zasowski said. "This is extremely useful and brings in new connections between these molecules and the dynamics of the Milky Way." "Almost a hundred years after their discovery, the exact nature of these molecules still remains a mystery, but we are getting one step closer to understanding what they are made of," Ménard said. "The era of big data in astronomy allows us to look at the universe in new ways. There is so much to explore with these large datasets. This is just the beginning."